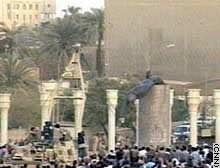 Crowds cheer as a statue of Saddam Hussein falls. BAGHDAD, Iraq (CNN) -- Iraqis danced and waved the country's pre-1991 flag in central Baghdad's Firdos Square after a U.S. Marine armored recovery vehicle helped topple the square's huge statue of Iraqi President Saddam Hussein. The statue -- the height of about four men -- was one of the symbols of Saddam's rule over Iraq and came down about 6:50 p.m. Wednesday (10:50 a.m. ET). Iraqis had begun tearing down portraits of Saddam and throwing shoes -- a grave insult in the Arab world -- and chipping away at the base of the statue with sledgehammers after a column of Marines advanced into the square Wednesday afternoon. A small group of men climbed the statue's pedestal and attached a rope around its neck. Shortly afterward, Marines backed an armored recovery vehicle up to the monument and attached a chain to the statue, which was erected last April to mark Saddam's 65th birthday. About the same time, a Marine draped the American flag over the head of the statue -- a gesture that drew a muted reaction from the crowd, gasps in a Pentagon briefing room and anger from a commentator on the Arab news network Al Arabiya. The crowd was happier to see the Marines take down the U.S. flag moments later and hang a pre-1991 Gulf War Iraqi flag around the statue's neck. That flag also was removed before the statue was pulled down. Several shots were fired at the Marines as they prepared to topple the statue. The shots sent Marines temporarily scrambling for armored personnel carriers as they sought out the source of the gunfire, but in a short time they were back at work on the monument.